IT WAS JUST before 7:00 AM when I got the call. I grabbed my laptop bag and my various and sundry gadgets and hurried over to HQ. “You know there’s nothing more important to me than you, Pennymoney,” I assured her. She rolled her eyes and buzzed me into the conference room. “L,” the head of AltiM@c Computer Consulting, was in no mood for pleasantries. L looked pained and cut me off before I could finish. Understanding that time was of the essence if I was to find a parking space for the Aston Martin near the studio, I turned towards the door, only to find “P” standing directly in my path. No doubt he had just completed another troubleshooting gadget to add to my already formidable arsenal. Of course, I’d still get the usual lecture about returning it to HQ in one piece. I turned my back to P and extended my arms as he helped me don what appeared to be a rather ordinary-looking jacket. At first glance I perceived it to be of a brushed cotton blend, Teflon-treated to resist moisture and stains. 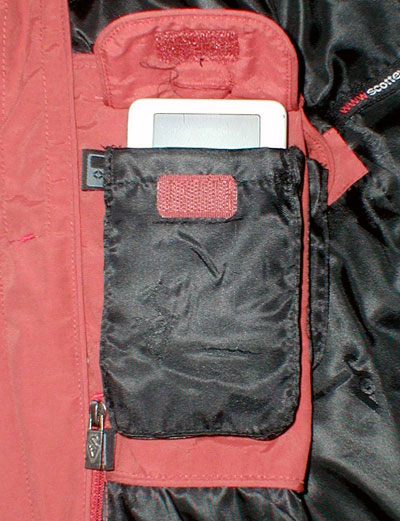 I was starting to warm up to this jacket, but I had another question for P.
The special iPod pocket (actually, there are two to accommodate various sized-iPods or other MP3 players) is so thin in front you can feel and manipulate the controls right though the fabric. I had to admit, I was quite impressed with P’s latest discovery. The jacket was surprisingly light and comfortable even after loading it with my troubleshooting technology arsenal. But I had one last concern about wearing this garment on a mission. I took that as my cue to set off on my mission, but L had one last request. “And do try to keep the jacket free of bullet holes…” added P.
“I’ll do my best, gentlemen,” I assured them. Outside, I fired up the Aston Martin DB5’s 4-liter, 282-horsepower motor and set off for Newark, secure in the knowledge that whatever troubleshooting gadgetry I might need to employ in the course of this mission, this SCOTTEVEST Essential jacket would be more than up to the challenge. Well, after spending some time with the Essential jacket, I’m happy to report that I did manage to keep it from being damaged—in spite of the ever-present danger common to my line of work. Unfortunately, here in central New Jersey at this time of year it tends to be a bit warm for jackets, so I was pleasantly surprised to discover that the jacket has zip-off sleeves, allowing me to get a little more mileage out of it before the dog days of summer set in. Plus, even with all those trademarked features and innovations, it’s still fully machine-washable. One of the almost surreal things about wearing and using this jacket is that simply knowing how to use a zipper or button, which most of us mastered in preschool, just doesn’t cut it here. With 19 special purpose pockets, you really need to invest some time in learning about all the different functions in order to use them to their fullest potential. But let’s face facts—who wants to actually read a manual for a jacket? Understanding this, the SCOTTEVEST folks took the initiative to create what I would call individualized “cheat sheets,” in the form of business-card sized instructions placed in each pocket. These miniature manuals are unique to each specialized pocket, so each time you reach your hand into a new pocket or storage area you are provided with detailed information on its function and use. Sure, it borders on the obsessive/compulsive, but this step tells me how seriously they take the innovations represented in their clothing line. Their Web site even includes a features glossary, so if you want to make sure you can recite the finer details of your garment’s Personal Area Network™ or MyMemory™ pocket to incredulous friends and associates, your edification is but a mere click or two away. 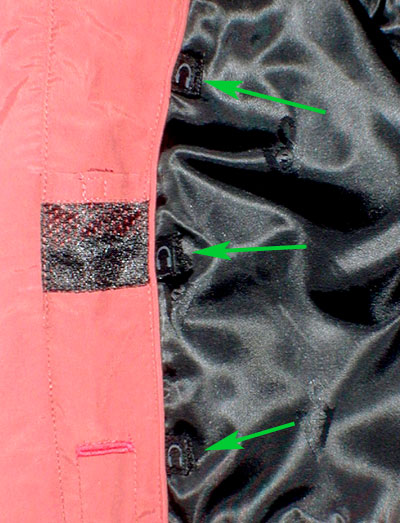 Arrows indicate the path of the Personal Area Network™, which gives you a way to channel your headphones through the lining of the jacket and up to your ears without creating a tangled mess of wire. It’s as if you installed your headphones into the jacket itself. 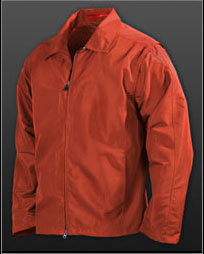 Above all else, what really impressed me is that for all its Gear Management Clothing innovations, its 19 pockets, its BudBuckets and CollarConnect™ and Weight Management System and all the other trademarked features,, the Essential jacket still manages to look like a sensible and practical lightweight jacket on the outside, offering little indication of all the technology that’s being transported within, and I think that’s where the jacket’s considerable price tag is justified. It’s really unfair to compare it to any ordinary jacket in terms of the thought and preparation that the SCOTTEVEST people have invested in it. So what’s the bottom line with this jacket? At $120, it’s no small investment, and you can surely find a similar-looking jacket, with three or four plain old-fashioned “pockets,” in the $40-$50 range. But there’s no doubt that if you do carry around a lot of gadgets, there is a huge advantage to this jacket over any other in terms of protection and convenience, as well as the sheer geek coolness factor (if such a thing can be said to exist). Just be prepared to take some time to familiarize yourself with all the options and the unique functionality of each of the pockets so that you can take full advantage of all the thought that’s gone into creating it.